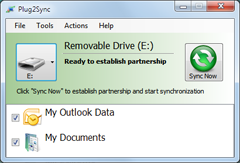 Plug2Sync and Backup: File Synchronization, File Backup, Outlook Sync and Backup. Plug2Sync and Backup is an innovative, versatile and time-saving solution for file synchronization, file backup and Outlook sync and backup. This drop-box like tool allows you to synchronize files accross computers and sync Outlook data using USB memory devices. In addition to that, Plug2Sync and Backup is also a reliable real-time backup tool which lets you backup files and folders as well as Outlook data. Using Plug2Sync and Backup is extremely simple: just select the folders you want to sync and backup, and click “Sync now”. Any changes made to the synchronized data will be updated automatically as soon as you connect the memory device. Real-time File Backup Software. Back up data to external hard drives or flash drives. PST backup tool to automatically backup Outlook emails and data. Synchronization & Backup Software for Enterprises. Sync and Backup to Flash Drive.